Aquarium Lighting is one of the primary things involved in the success of your aquarium, be it a freshwater planted tank, or a coral reef aquarium. Lighting is important because plants and some algae require light to thrive. 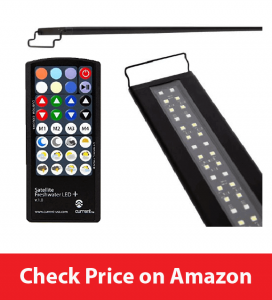 Below are the Best Aquarium LED lighting systems reviewed, available for you so you can have the best aquarium setup. 3.1 Why do we require Aquarium Lighting? 3.2 What kind of aquarium lighting are available? 3.3 Why Choose LED Lighting? 3.4 How to Choose LED lighting for Aquarium? The Current USA is one of the most trusted brands in Aquarium Lighting and they have never failed to surprise with their innovative products. The Current USA Satellite Freshwater LED+ is a fully automatic LED lighting system for Freshwater Aquariums. Your planted aquarium will prosper with this LED light, as it is equipped with Super bright 6500K White LEDs and paired with full-spectrum RGB LEDs to provide you with all the colors under the sun and even more. The body is an IP65 water resistant, and the system works at a low voltage of 12VDC. Natural Light is mimicked perfectly, and it has other modes like a ‘Dusk Mode‘ for evening time viewing, ‘Cloud Setting‘ with the lowered intensity of the light to give a natural feel, along with a ‘Thunderstorm Setting‘. Also, there is a total of 6 preset modes which you could set that includes: Orange, Light Blue, Rose Pink, White, Full Spectrum, Purple. You can control the colors and the modes via a 32 key remote control. Adjust the colors of lighting required as per your needs and store them with 4 available memory modes. The Finnex Planted Plus 24/7 fully automated LED replicates naturally occurring light by mimicking Daylight and Night time perfectly which give your plants the right balance of light and dark, and an appropriate photoperiod. The Finnex Planted Plus 24/7 is built thinner and lighter than most of its competition and comes with 4 RGB preset settings. With settings like Cloudy, Thunder, Sunny and Moonlight you will improve the overall look of your aquarium. The best part of this LED is unarguably the 24/7 Mode which with its built-in timers and settings, completely simulates natural lighting throughout a 24-hour cycle which includes a gradual increase in intensity at ‘Sunrise’, a gradual decrease at ‘Dusk’ and Night modes. All of this is fully automated without needing you to intervene at any time. All of these features a Remote Control that works just fabulously. You could also create different colors of your choice by adjusting the intensities of RED, GREEN, and BLUE using the remote. Giving you millions of color options to create. Another brilliant product by Finnex is the Finnex Fugeray Planted Plus, which makes our list. Finnex Fugeray Planted+ has an ultra slim body with evenly spaced LED lights that give a balanced output, which makes it great for low-medium light demanding plants and marine refugium purposes. All FugeRay models feature a moisture resistant ‘PC Splash Guard‘ which protects against water splashes and other mishaps. With the incorporation of the ‘TRUE 660nm RED LEDs‘ which studies have shown to be the best for plant growth, you cannot go wrong with this one. The True 660nm RED LEDs give a warmer tone to the aquarium set up if needed. The unique leg feature of this LED allows it to be mounted onto aquariums of various sizes as well as on sumps. The Finnex Fugeray Planted+ also have 12 Blue LEDs fitted which gives a beautiful Moonlight effect. The Marineland Aquatic Plant LED system is a LED light with a streamlined and compact body. It comes with a specially designed Polycarbonate Lens to maximize light penetration in your aquarium. Ensuring that the light reaches the bottom of the aquarium. Marineland Aquatic Plant LED system has an integrated timer that is fitted on the sides of the LED strip. As maintaining a definite photoperiod is essential for plant growth and health, the timer helps by automatically adjusting the lights after a specified time frame. 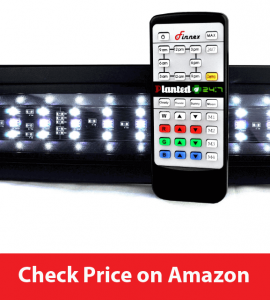 The lighting strip has 6500K LEDs are combined with 3 watt RGB LEDs to give out a perfect balance your aquarium. Flexible mounting options and sizes of the LED unit allow it to be used with a variety of aquarium sizes. A simple, and fully controllable aquarium light that can do everything it needs to do and even more. 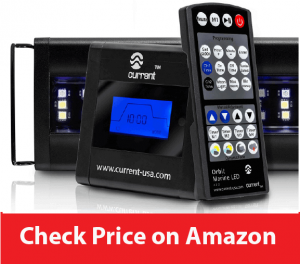 The Current USA Orbit Marine Aquarium LED is a thin, sleek and powerful LED that lets you take control which is available for an aquarium of any size. Powered by a Dual Actinic LED spectrum, combined 8,000K/12,000K white light the lighting system produces strikingly impressive colors. All of these housed in a sleek aluminum strip with IP65 water resistant LED that keeps its safe from mishaps. Additionally, you could use a Tank Arm Mount Bracket to mount the strip. 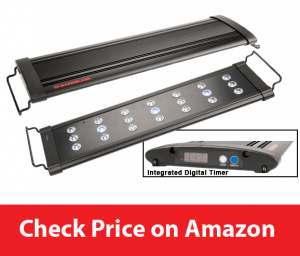 With an innovative Ramp Timer Pro LED controller, it gives a 24-hour Day-Night simulation that is just perfect. That’s not it, you could control the intensity of the lighting, on-demand weather effects, adjust the duration giving you the complete control over the aquarium lighting. And with it is all the above features, it even works on low-voltage, 12VDC and has a maximum power consumption around 18 Watts – 46 Watts (Depending upon the model). After the success with the Original Marine+, Finnex has revamped the product to a much economical package with the Marine+ 2 while retaining the original light output. 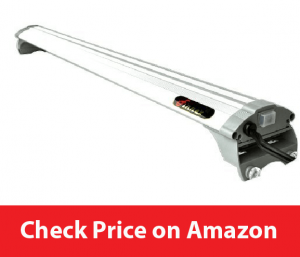 With evenly spaced LEDs it gives out a steady beam thus your aquarium is evenly lit. This is also useful for soft corals or fish-only aquariums that do not require very intense lighting. The LEDs have a spread of up to 120 degrees, thus even though the panels are slim they can easily light up the largest of aquariums properly. Coupled with high-quality aluminum which acts as the heat sink for this fixture, providing efficient cooling and heat dissipation. All models are moisture resistant with a ‘Splash Guard‘ which protects the unit from accidents. This light also features ‘actinic moonlight’ which simulate evening time and give a pleasant feel to the aquarium in which corals are vibrant and lush. 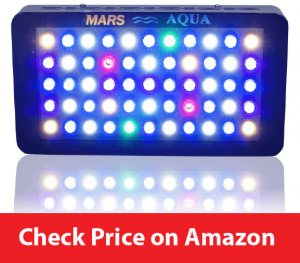 This LED for reef aquariums by MarsAqua will certainly not disappoint you. The unit is nicely constructed and is extremely bright. With 55 3 watt LEDs, this thing works great. The LEDs are housed in a black casing which you could hang on the top of your aquarium. The Blue and White Dimmable LEDs are totally controllable and the PAR of these lights is remarkable even at the deepest of tanks. 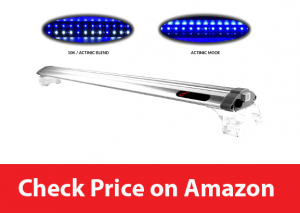 This brand has over 5 years of experience with LEDs for Reefs and planted tanks, so rest assured you will get one of the best products out there for the price range it’s offered in. MarsAqua Dimmable comes with two power cords and two ‘on/off’ switches with which you can control the Blue and White light individually. 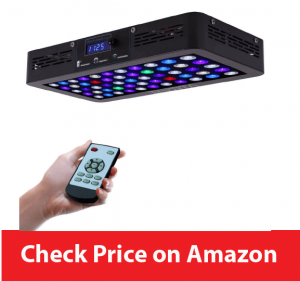 This is a very affordable reef aquarium LED lighting unit and gives you great quality nonetheless. VIPARSPECTRA Timer 165W LED Aquarium light is the latest addition of to the line of products by the manufacturer and it comes with a lot of amazing features. With 55 3W LEDs in two channels One for Violet/Indigo, Royal Blue and Blue spectrums and the other includes the Neutral White, Cool White Green – Red spectrums, this light is amazingly bright. With a 90 Degree secondary LED Focusing Lens you can get much greater penetration of light thus making it useful for a variety of tank sizes. And the unit works has a lifespan of 100,000 hours. Why do we require Aquarium Lighting? The quality of Aquarium lighting directly corresponds to the quality of Aquatic life in your aquarium. Aquatic lighting must be chosen with a goal of simulating natural lighting conditions depending upon the type of the tank. Correct lighting not only helps aquatic plants achieve best health and growth by optimum energy for photosynthesis, but also fish and other life thrive better with proper day/light timings. If the correct spectrum and intensity of light required for photosynthesis are not available, the plants will have poor and slow growth and some may even fail to thrive. With correct lighting, overall health and well-being of the entire aquarium can be ensured which in turn results in an aesthetically pleasing and satisfying aquarium. What kind of aquarium lighting are available? LED lights are the latest type of lighting providing huge benefits over the traditional lighting systems. Light-Emitting Diodes (LEDs) have two semiconductors placed in a small case, which emits light when a suitable voltage is applied. LEDs are small and compact and provide for adequate intensity and brightness nonetheless. Cost: LED is quite cheaper than the traditional lighting systems making them one of the preferred choices for lighting. Life of Operation: Traditional Options last to a maximum of 10,000 hours, LED lights to have a life of over 50,000 hours. A variety of Sizes and Types: Lights of different colors and intensity: By varying the voltage, LED lights can be dimmed thus reducing the intensity of light. Different colors and wavelengths vital for photosynthesis can be mimicked with LED lights easily by using appropriate diodes. How to Choose LED lighting for Aquarium? Not all Plants require the same kind of lighting. While the coral requires actinic lights for the photosynthesis and growth of invertebrates, freshwater fauna may not require it. So make sure that the lights installed are fulfilling the spectrum requirements of the flora and fauna. It is always nice to imitate the lights of the natural habitat. If the intensity of light in your aquarium is too much, you probably might end up having algae issues. These could be solved by either lowering the intensity of light which most of the LED lighting come with. Or by elevating the lighting from where it is, so less light penetrates in. But if you have a larger aquarium with smaller lighting system might not help as it would not serve the purpose of having the lighting system. In such cases, you might want to add more lights to your lighting system. So make sure you pick the LED lighting system that is appropriate for your fish tank. Sometimes these features come in handy, like the 24-hour feature which lowers the intensity of the light during the night. Such features eliminate the need of manual intervention resulting in better aquarium health.